Cutlery is essential to the operation of every commercial kitchen, so it is important to know the best techniques for kitchen knife handling and safety. 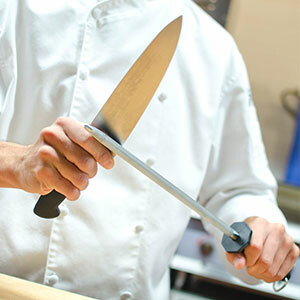 Proper knife training can help minimise the risk of personal injury and keep your kitchen running smoothly. If you are just beginning to learn or simply need to brush up on your approach, keep reading for some helpful knife safety tips. When you use a dull knife to cut, you need to apply more force. As a result, the knife is more likely to slip and increases the risk of injury. Keeping your knives sharpened is one of the easiest ways to keep them safe. Simply use a sharpening stone or knife sharpener to maintain the original precision of the blade. If your knife needs just a touch up between thorough sharpening, try using a sharpening steel. Knowing how sharp is sharp enough can also help make your knife safer to use. To balance sharpness and durability, most knife blades are designed with a 20-degree angle on each side of the cutting edge. If your dishes feature many soft ingredients, you may want to sharpen your knife to 15 degrees per side. This narrower angle requires more frequent sharpening, though, and may decrease the overall durability for your knife. If many of your ingredients are harder in texture, keep your blade at 20 degrees on each side, or choose a wider-angle blade when appropriate. Correctly selecting a knife for the task at hand is one of the most fundamental knife safety tips that food service professionals should learn in their training. However, making this choice can be overwhelming because of the wide variety of styles, shapes, and sizes of commercial cutlery. When choosing your knife, a good starting point is to consider blade size. For example, a small paring knife will not be very useful for butchering a large cut of meat, so use a cleaver instead. Then, consider the amount of flexibility required to cut your ingredient. Are you removing scales from a fish? A flexible filet knife is great for the job. Finally, think about the kind of blade edge you need. Serrated knives are excellent for cutting through foods with tender centres. Always remember, a knife is not a can opener, screwdriver, or box cutter! Using your knife for tasks outside of its intended use could not only put your safety at risk, but also damage your knife. Be sure to train your staff not to use knives to cut non-food items. In order to prevent contamination, it is important to clean your knife as soon as you’re done using it. Leaving your knife on your cutting board or in a sink full of soapy water clutters your kitchen and creates opportunities for contamination and injury. When you immediately wash your knife and return it to its storage space, you help to keep your fellow workers and your patrons safe. A clean knife is also easier to handle. Food residue can make your knife slippery, and cutting requires a secure grip for optimal safety and effectiveness. To ensure sanitation and maintain your knife’s durability, be sure that you are washing your knife properly. Some knives may not be dishwasher safe in order to retain their precise edge. Other knives may have handle or blade shapes that are more likely to collect food debris, so inspecting your knives before and after washing can help prevent food from building up. A designated knife storage space keeps your kitchen organised and also encourages a safe knife use routine. When not in use, your knives should be stored out of the way of your work space. Simply putting your knife in a drawer is not safe for your workers or your knife. Storage solutions like knife blocks or rolls prevent mishaps and increase the longevity of your knives. 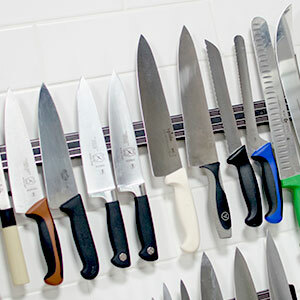 Storing your knives in a block or rack avoids unintentional grabbing and dropping while keeping your knives easily accessible in your preparation space. In the same way, knife bags, rolls, and cases protect your knives from contaminants and accidents, but with added portability. When you drop your knife, your natural instinct might be to grab it. For your safety, let it fall! A dropped knife can be sanitised and replaced if need be, but your hands will not heal so easily. Though a commercial kitchen can be a hectic place, always give the knife and task your full attention. If you’re distracted, stop what you’re doing and deal with the distraction before returning to cutting. That way, you can stay safe and produce your best work. These knife safety tips are just the beginning of proper knife use in your commercial kitchen. Failing to enforce these procedures could turn one of your most-used tools into a hazard. Always remember the basics of kitchen knife handling and safety, and be sure to train your employees on the proper usage techniques any time you introduce a new knife into your tool set.